Yikes, where did the first day of the new year go? Justin and I were having so much fun visiting with family that we lost track of time. No matter—it’s never too late for a recap and a look forward! I launched this blog almost a year ago, after a feverish four-day weekend spent customizing my site. In my time online, I’ve made 64 posts and garnered 8 comments. While I’d hoped to connect with more people, I’m proud that I’ve averaged just over a post a week. I know that these posts have been concentrated in the beginning and end of the year, so I’d like to work on increasing both my frequency and regularity of posting. I really do enjoy the writing, even if I’m excruciatingly slow at it. Set up a permanent sewing space. In our last apartment, I had plenty of space to create a dedicated sewing area, but I never bought or built the furniture I needed to make the space work, so it mostly served as a dumping ground. In the new house, we have an office and a guest room, both of which provide a place to put a sewing table and possibly a cutting table. Having my machines, tools, and supplies ready to go at all times will enable me to spend less of my time preparing to sew and more of my time actually sewing. Stop feeling constrained by my fabric stash and sew the garments I need and want. As I’ve mentioned previously, I have a small bin of fabric that consists mostly of quilting project leftovers and de-stash pieces from my mom. Not wanting any of this material to go to waste, I’ve often looked for projects to use it up. The problem is that these projects are not themselves necessarily things that I need or want, which means even when they’re successful they’re not particularly useful. If I want to make T-shirts, I need to buy fabric suitable for T-shirts. I don’t have to use up the scraps first; they won’t go bad. If I need them for a project down the road, they’ll be right where I left them; if I don’t think I’ll ever use them, I don’t need to contrive a purpose for them—I can just give to someone who will use them. Be a more productive knitter. I completed only 6 knitting projects in 2015, including one I started in 2014. This is roughly on par with previous years’ output, but I know that I’m capable of more. I’m a largely monogamous knitter, and I don’t suffer from startitis. Quite the opposite—I usually struggle to decide what to cast on, which means I can go days or weeks between finishing one project and starting the next. 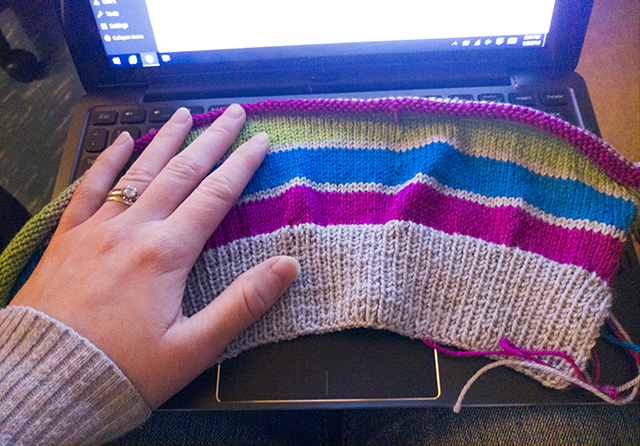 I don’t enjoy these long breaks, and become anxious and dissatisfied until I get a new project on the needles. To combat this, I’m going to be more mindful of queuing projects so that I have time to purchase patterns or choose yarn before I finish my current knit. That way, I’m not trying to decide on a new project while feeling agitated that I haven’t started something yet. I may even try out casting on before my current project is complete so I never have a time when there isn’t something on the needles. Learn how to dye fiber with natural ingredients. Dyeing, particularly natural dyeing, is an art I’ve wanted to research since I visited Old Salem for my birthday in 2014. Justin gifted me The Modern Natural Dyer for Christmas, and I’m eager to start learning and experimenting. On the whole 2015 was a good year for us, which makes me even more excited for the possibilities of 2016. This entry was posted in Uncategorized and tagged reflections. I have to commend you for being dedicated to scrap busting. I have lots of left over fabric that I keep saying I will do something with, but then there is a sale at my local fabric store and well my plans seem to get left in the dust. Haha, thanks! Lately I’ve been using bits of quilting cotton to make bias tape, and I love the idea of colorful printed pocket bags and facings in otherwise utilitarian staple garments. I stay far, far away from the sale bin if I can help it. I once found myself on a yarn retailer’s website looking specifically at clearance yarns that I could rescue. I only just managed to close the browser and walk away before buying my weight in discontinued wool.